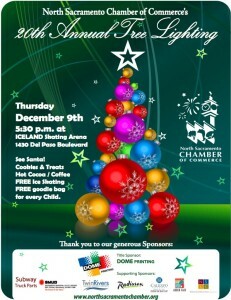 With Iceland Ice Skating Rink unable to open, the North Sacramento Chamber of Commerce has moved its 20th Annual Tree Lighting to the nearby Woodlake Community Pool. Santa is scheduled to be there with cocoa, treats, goodie boxes, and entertainment. Kids will receive 2 for 1 ice skating passes to skate Iceland after the City approves it’s opening. The event takes place tomorrow evening at 5:30pm. Sponsors of the event include Dome Painting, Subway Truck Parks, Twin Rivers School District, Radisson Hotel Sacramento, Cal Expo, Arden Fair Mall, SMUD, and the North Sacramento Land Co.
December 9, 2010 in Iceland Skating Rink.